Sleep masks are my key to a good night's sleep and when I recently saw Kim Kardashian rocking this uber cute "Dreaming of Paris" mask, I knew I had to have it. Designed by Mary Green, the satin mask retails for $22 and features a luxurious lace trim. 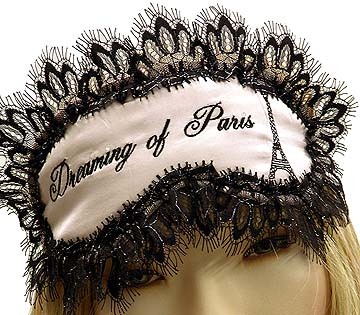 You can use this gorgeous mask to get your beauty sleep.... or for other things that happen in your boudoir.